We’re in the midst of a life sciences revolution. The natural world, including our own bodies, is becoming malleable in a completely unprecedented way. Today, we have the ability to turn any human cell into a stem cell and grow tissues in a lab. We’re getting closer to bio-printing full organs, as well using DNA as a viable information storage method. You can get your entire genome sequenced for $1000, and that price is only going down. Genetic editing with tools such as CRISPR/Cas9 is a revolution in and of itself. And scientists are creating global collaborations on incredible new projects like Genome Project – Write. These early adopters are recognizing something really important: biology is a powerful technology, and if we can harness it, we can use it to create and build things we need in a completely novel and much smarter way. But as important and powerful as these new tools and breakthroughs are, they are still pretty inaccessible to those without a background in biological science. This is why I was so excited when I met Julie Legault, founder and CEO of Amino Labs, earlier this year at Singularity University’s Exponential Medicine conference. Julie is a huge inspiration to me, and her story of starting Amino Labs can be an inspiration to anyone interested in synthetic biology and bioengineering. 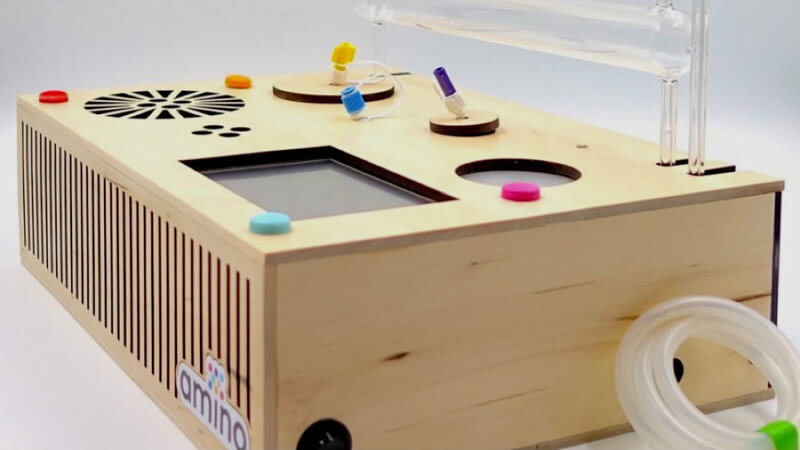 Amino Labs is a lab-in-a-box that allows anyone (read: non-biologists) to learn how DNA can be used to program living systems to create things. Amino Labs is the best tool I’ve seen yet for allowing someone who doesn’t have any background in biology to create something (like a glowing bacteria night light) that teaches basic bioengineering techniques while also sparking the imagination of what’s possible. 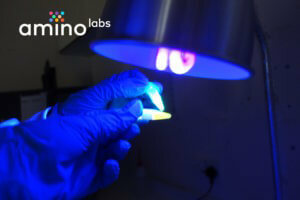 Amino Labs started as Julie’s thesis project at MIT Media Lab. She had been focused on wearables and from there became interested in chemical reactions in clothing, which led her to research what was happening in synthetic biology. 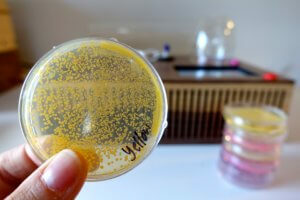 When she participated in a workshop to grow banana-scented bacteria, she was hooked. But heading into the MIT Bio Lab was overwhelming. In front of autoclaves, centrifuges and pipettes, Julie realized she wasn’t quite a seasoned synthetic biologist yet. She was doing alright in a workshop setting, but as soon as she was on her own, it wasn’t as simple. “It’s like there was a level of simplification that was missing both in terms of using the equipment and knowing what order to do things in. I kept bugging Justin [founder of Synbiota], but it was still over my head… That’s when I got the idea of building a kit that would allow people to get the basic experience of engineering bacteria — and having their lives change in the process, or at least appreciate bioengineering,” Julie explained to me. She spent the next year developing a working kit, now called Amino Lab, which led to a successful Kickstarter campaign and seed funding from MIT’s E14 Fund, then an invitation to join Indie Bio’s Accelerator program. 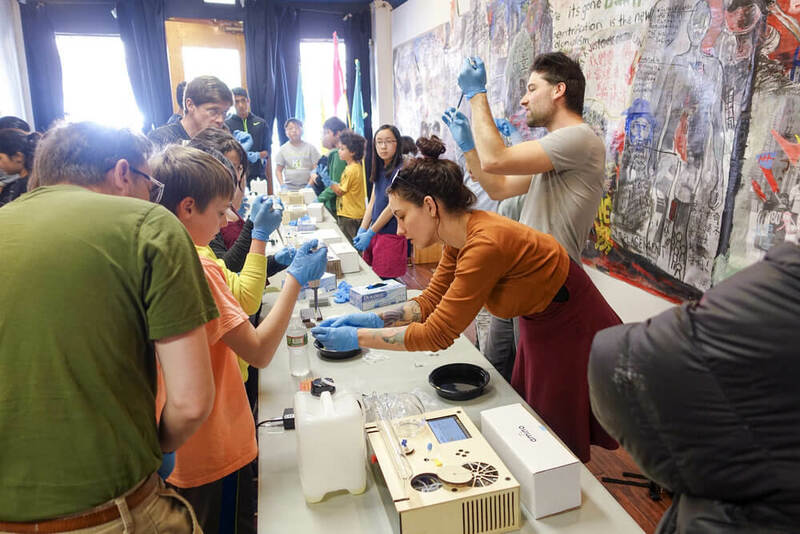 Julie has described the Amino Lab as “the Tamagotchi for synthetic biology” and a “bento-box lab.” Today, it’s a beautifully designed, playful, easy-to-use platform for learning bioengineering. When asked about her big, audacious goal, Julie says: an Amino lab in every home. But that’s a ways off. She doesn’t think society is ready to start prototyping their own engineered bacteria just yet, and there’s still that icky factor of bacteria to get over. That’s why she and her team are focused on education at the moment.